It’s been interesting this year to see vegetarian Thanksgiving menus become completely mainstream. The New York Times has lots of vegetarian Thanksgiving recipes online and had a vegan mushroom gravy recipe in its food section last week. The Seattle Times had an entire article about vegetarian gravy. I put my vegetarian gravy on Fit and Fed just last year and at the time I didn’t know anyone else who made it. Stuffed squash recipes for Thanksgiving also abound. Some cook a big squash or pumpkin to make a centerpiece food item like a turkey. I’ve never tried that, but it sounds a whole sight better than tofurkey! 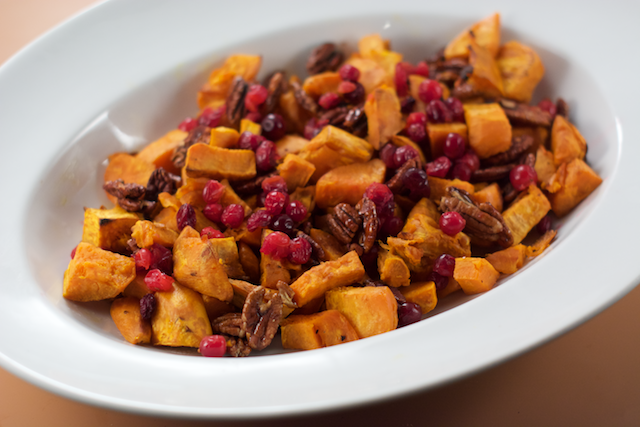 For this recipe I combined sweet potatoes with maple candied pecans and unsweetened cranberries. I like the balance between the sweet candied pecans and the tart cranberries, with an overall sweetness from the sweet potatoes. I can’t imagine adding a whole lot of sugar (or marshmallows ) to a sweet potato dish, to my palate they are naturally very sweet already. For tomorrow I’m making my maple roasted brussels sprouts, rosemary bread stuffing with chestnuts, mashed potatoes, vegetarian gravy, cranberry sauce, and pumpkin pie with whipped cream. I have two of my sons home and we will have some new friends over. Given that I’m mainly cooking tonight, not blogging, I’ll keep it simple and share this recipe. I use my own maple candied pecans. Peel and cube sweet potatoes into smallish cubes (an inch or less). Place sweet potatoes in two 9 by 13 baking pans. Bake for about 40 minutes, stirring and checking the sweet potatoes at 30 minutes. Cover with aluminum foil, bake covered for an additional 10 minutes. Cook the cranberries in a small pot in a little water, or steam them, for about five minutes. Prep time does not include making the maple candied pecans. 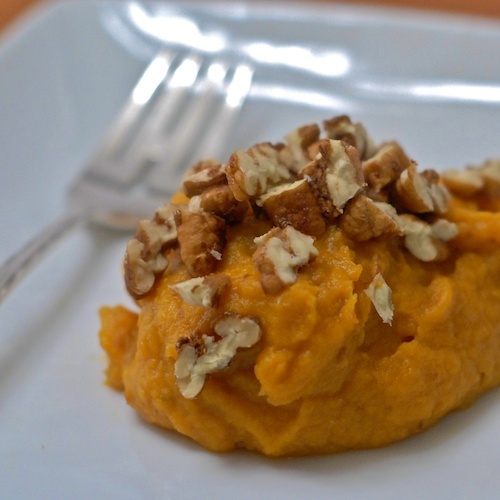 Mashed Sweet Potatoes with Candied Maple Pecans Crunchy bits of candied maple pecans top these easy mashed sweet potatoes. They taste rich and sweet without added sugar or oil. 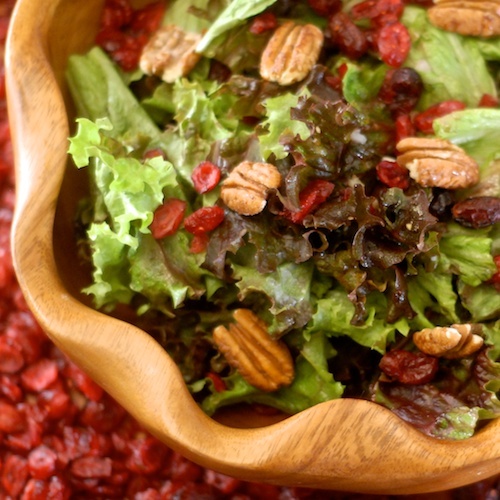 Cranberry Candied Pecan Salad with Raspberry Vinaigrette Try this ten-minute dinner salad with sweet-tart dried cranberries, crunchy candied maple pecans and raspberry vinaigrette. Maple Candied Pecans, the Oven Method Pecans roasted in the oven with maple sugar, salt and demerara sugar. 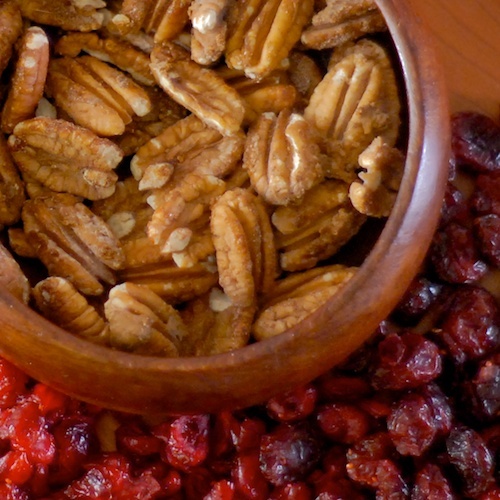 Maple Candied Pecans, the Stove-Top Method Sweet and maple-y with a touch of salt, these maple candied pecans will be ready to top your salad or dessert with less than five minutes work. If you had vegetarian guests I’m sure they appreciated it, Greg! They are a no-lose proposition.